Has your dining area been lacking in function and style? You’ve probably got a lovely dining table and plenty of comfortable chairs to accommodate your family and occasional guests. However, when it comes to serving your food and housing your extra dishes, you need a better solution. The distance from the kitchen counter to the dining room becomes far too long when you are making multiple trips. Carrying your dinner to the table, one dish at a time, can become very frustrating when you are doing it meal after meal. It would be much more convenient if you had an additional table to utilize, a space for spreading out the various bowls and platters necessary to serve all the elements of your meal. By adding a new sideboard table to your dining area, you are creating a workable space that will prove to be very useful at meal time and pretty to look at all of the time. 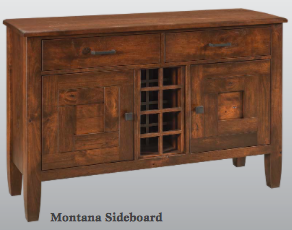 This specific Montana Sideboard table by Woodside Woodworks LLC is the perfect picture of charm and elegance paired with the durability and strength that solid wood provides. This amazing table shown here comes in your choice of material, such as oak, cherry, maple, hickory, etc. And you can rest assured in knowing that each piece of this American made furniture is carefully crafted with many specializations provided and many others available upon request. When you purchase new furniture for your home, you want to invest in something that will stick with you for many years to come. A sideboard table will bring a usefulness and air of luxury to any room in need. Though traditionally used in connection with dining and food service, these tables are also an excellent addition to many other areas of your home. Your foyer may be missing this type of table to add warmth to the open space while housing your décor. Your home office or guest room may need that extra table top and storage space that goes beyond the smaller coffee table size. Come out to Amish Furniture Showcase today, and you’ll find yourself falling in love with these sideboard tables and all of the possibilities that they bring to your home!